Paradise of the Pacific : Surf Riding, Waikiki, 1904. PO Box 789, Honolulu, Hawaiian Islands, February 1904. Volume 17 Number 2, page 17. 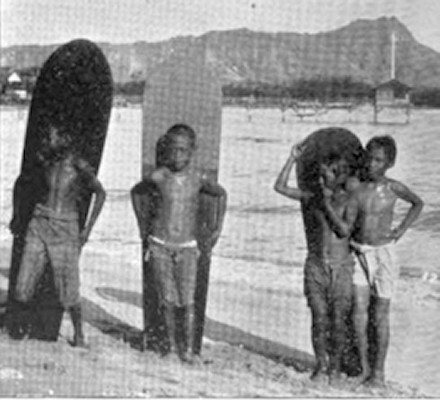 Surfboard riding is one of the few ancient Hawaiian sports that are still in vogue. While in old times the natives, with few occupations besides ﬁghting and ﬁshing, had plenty of time at their command for indulging in the thrilling pastime of surf riding, in these days of civilization, when they are obliged to perform earnest labor for a livelihood, they get little opportunity for playing the games of their ancestors. However, in the neighborhood of every beach there are still found a few young men and boys who are expert surf riders. The illustration below depicts four youngsters standing on the beach with their surfboards. The practice is to swim out from shore 50 or more fathoms with the surfboard under one arm and then to lie upon the board and swim towards the shore. Just as the surf is approached the swimmer stands erect on his board and ascends and descends with the breakers. The skill consists in keeping aboard the craft in a standing attitude and riding up to the beach. As in all other sports practice and mental calculation win. A novice would experience the same difﬁculty in mastering this game that he would in riding a bucking broncho. 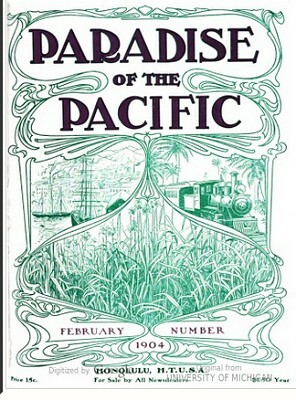 Geoff Cater (2016) : Paradise of the Pacific : Surf Riding, 1904.